Collections. We all have them of various sorts – dolls, figurines, antiques, china, etc. I collect Nativity scenes. Well, not intentionally. Years ago, Mother gave me our first nativity scene, the one she bought when I was a baby that she placed under the Christmas tree every year. Then, when I returned to teaching, she gave it to me to bring to my classroom and show the children around Christmas time. Ooooh, the children would gasp when they saw it the first time. I have one like this under our tree, some would say. More would say, what is that, as they would pick up one of the characters and look at it more closely. About 18 years ago, Mother and Daddy were on another cruise that took them to Russia. Mother found several stackable dolls and gave me a stackable doll nativity set. Oh, how I loved this quaint little set with all the small pieces. I would also take it to school to show the children, a little more cautious with it since it had such tiny pieces. The baby Jesus was no bigger than a child’s finger! On yet another trip to Israel, she brought home an olive wood carved nativity set that she used for awhile then passed on to me several years ago. 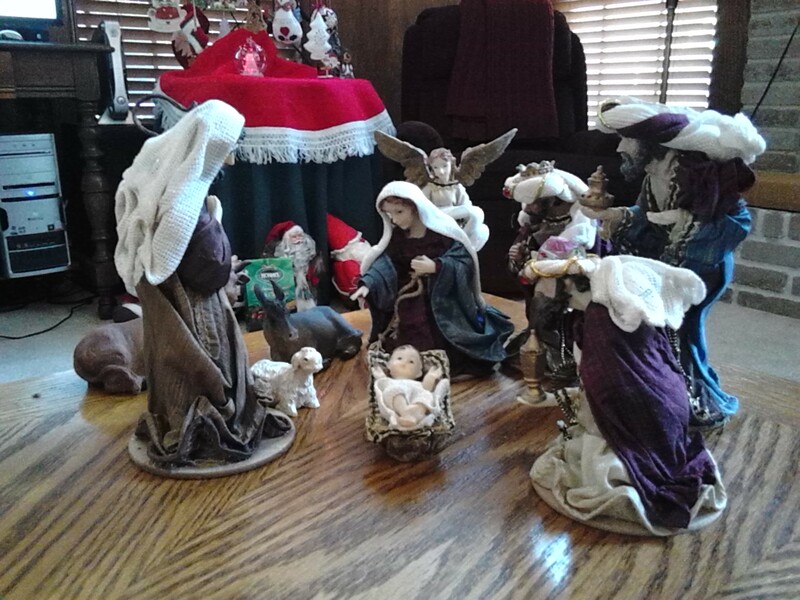 My son Philip gave me a beautiful nativity set for Christmas a few yeas ago and it sits on our coffee table in the den in front of everyone. This year, I brought the old well-worn nativity set home from school for good. 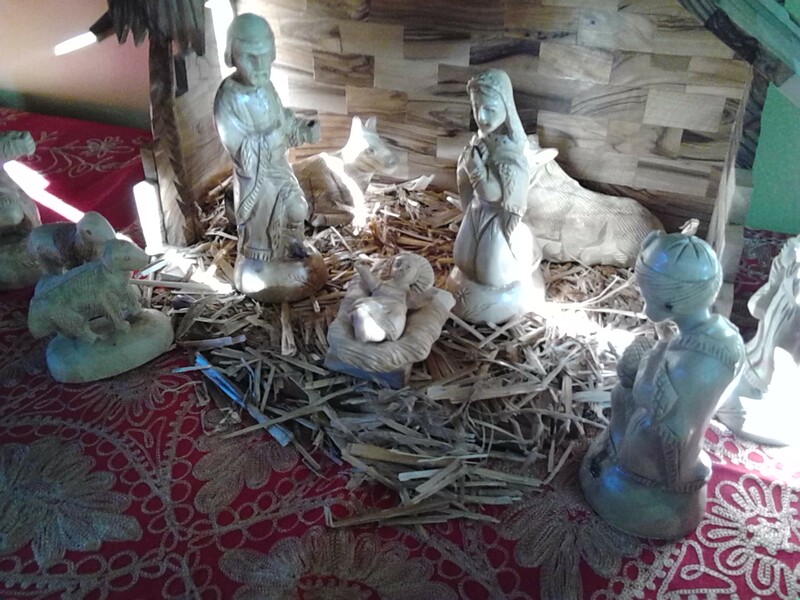 As I unfolded each piece from its sixty year old tissue paper and place it in the little stable, I held the pieces in my hand a little longer, staring at their faces. I hadn’t ever taken the time to do that – at least, not in a very long while. 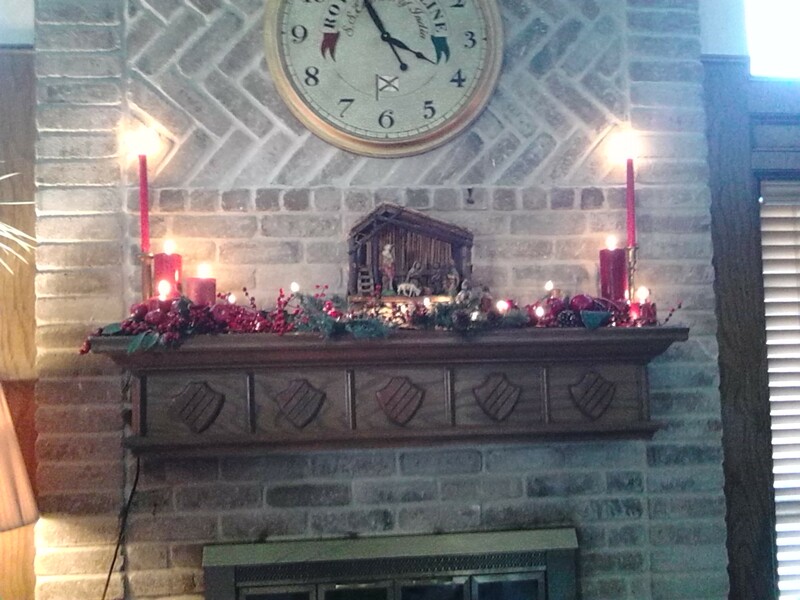 I got my camera and began taking pictures of the nativity scene on the mantle – up close pictures and after they were downloaded on the computer their faces were even more clear and almost alive. I picked up Mary and held her for a long time. 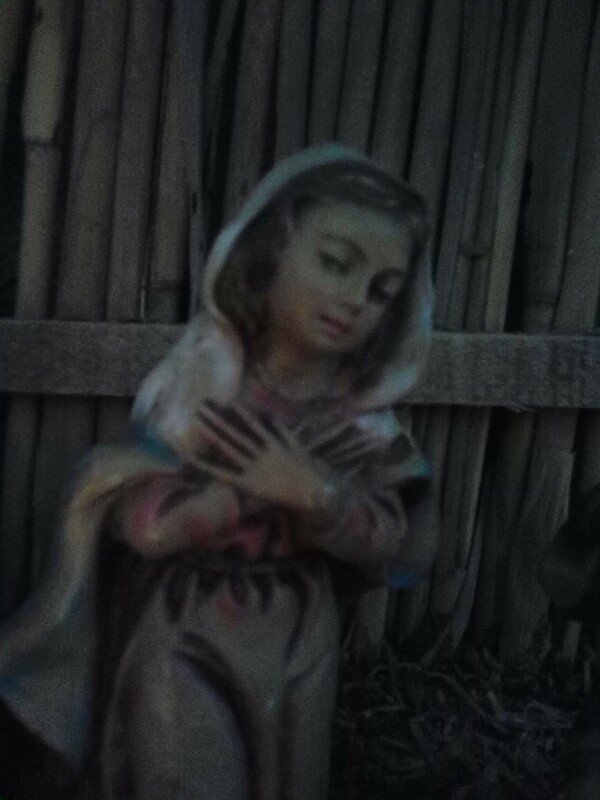 Dressed simply, as a young peasant girl, her eyes barely open, as if looking down at the baby in the manger. What was she thinking? Her long fingered hands draped across her chest. Can it be, she’s thinking, that this is truly the son of God, as told me by that angel nine months ago? Oh, Jehovah, what a responsibility. I will need you to help me raise him. Look at how tiny he is! Yes, look. 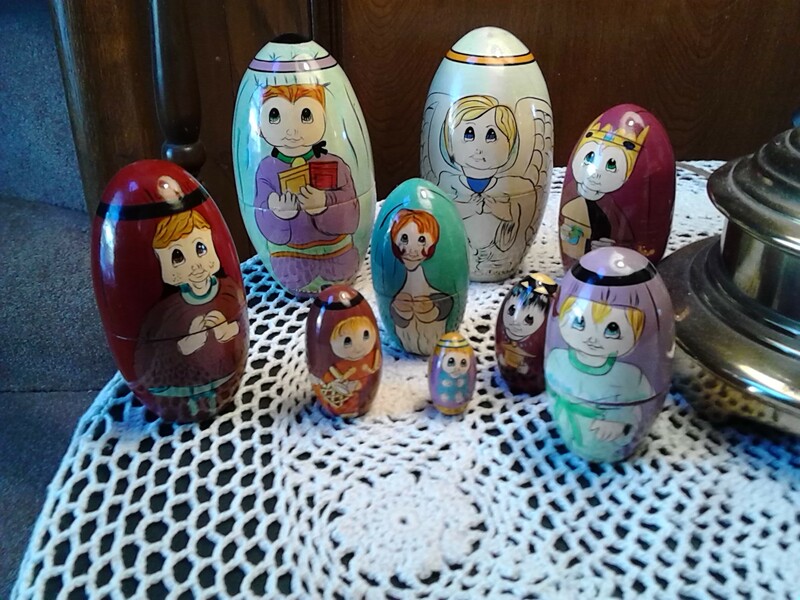 Take a long look at the faces of the figurines in the nativity set. What are they each thinking – this moment in time when a baby is born in a rude old stable in a crowded little obscure town to poor traveling peasants from a long ways away, on this untimely journey just to obey the foreign government. Because of an angel, a dream, a star, the folks in the stable got it. They each knew – Mary, Joseph, the shepherds, and later the Wise Men had all been forewarned that they were about to witness a miracle, the fulfilling of a long awaited prophecy – the coming Messiah, who would save His people. So, perhaps what each were thinking was, “I am part of an historical event! How will God use a baby to save His people?” Joseph, now the protector of this baby – not his, was to get his directives from yet another dream; the shepherds were so excited that they told their families; the Wise Men received direction from a dream, and Mary. Mary kept all these events in her heart. She marveled at how God was moving in her midst, as she kept trusting. May we ponder, be alert for His directives in our lives, and trust. Keep trusting in this blessed Savior – the Lord Jesus Christ. Merry Christmas, Everyone! Now, go out with Joy and be led forth in His peace. Next Post Volunteering – what’s the payback?